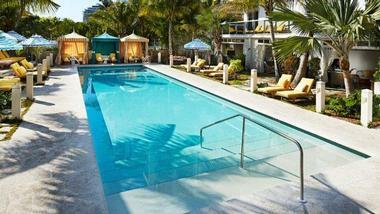 The Confidante Miami Beach is a gorgeous Art Deco inspired hotel in the heart of Miami, Florida. The Confidante Miami Beach exudes the glamor and charm of Miami's Golden Era with beautiful Art Deco architecture, stylish accommodations, modern amenities, eclectic eateries and breathtaking ocean views. 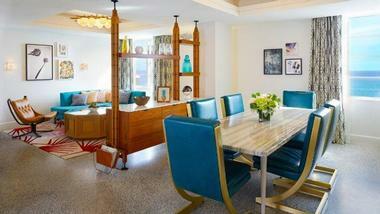 This stunning oceanfront Miami Beach escape features mid-century modern decor with pops of color and a distinct 1950s flair, signature dining at a chic brasserie and Asian-fusion eatery, two heated outdoor swimming pools with direct beach access, an open-air rooftop spa, and serene garden, and afully equipped fitness center. Live entertainment in offered with a curated event calendar that consists of an all-female DJ series line-up to Late Night Noodles and over 15,000 square feet of contemporary and flexible event space make it an ideal locale for weddings, celebrations and business functions. The Confidante Miami Beach features 363 well-appointed guestrooms, including 16 luxury suites, designed and decorated in a vibrant Art Deco-inspired style with modern amenities. All rooms feature private bathrooms with rain showers, plush terry robes and organic bath products, flat panel televisions with cable channels, individual climate control with heating and cooling, retro bar carts with minibars, and complimentary high-speed wireless Internet. Standard Rooms are 250 to 300 square feet in size and feature one king or two queen-size beds in 400-thread count linens, private bathrooms with enclosed rain showers, contemporary Art Deco furnishings in vibrant hues. Modern amenities include flat-panel televisions with cable channels, individual climate control with heating and cooling, retro bar carts with minibars, and complimentary high-speed wireless Internet. View Rooms are 325 to 400 square feet in size and feature one king or two queen-size beds in 400-thread count linens, private bathrooms with enclosed rain showers, contemporary Art Deco furnishings in vibrant hues. Modern amenities include flat-panel televisions with cable channels, individual climate control with heating and cooling, retro bar carts with minibars, and complimentary high-speed wireless Internet. Deluxe Rooms are 235 to 600 square feet in size and feature king-size beds in in 400-thread count linens, private bathrooms with enclosed rain showers, contemporary Art Deco furnishings in vibrant hues. Modern amenities include flat-panel televisions with cable channels, individual climate control with heating and cooling, retro bar carts with minibars, and complimentary high-speed wireless Internet.Deluxe Rooms have beautiful views of the Miami skyline. Suites range from 625 to 1,205 square feet in size and feature king-size beds in 400-thread count linens, private bathrooms with enclosed rain showers, contemporary Art Deco furnishings in vibrant hues. Modern amenities include flat-panel televisions with cable channels, individual climate control with heating and cooling, retro bar carts with minibars, and complimentary high-speed wireless Internet.The Penthouse and Miranda Suites have separate bedrooms, living rooms, and dining room areas and all boast breathtaking views of the city skyline and ocean. 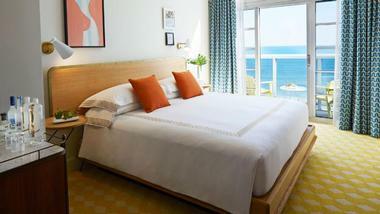 The Confidante Miami Beach is home to two award-winning restaurants with oceanfront locations and sweeping sea views. Seagrape is a casual brasserie that serves a menu of fresh seafood and locally sourced produce infused with Caribbean influences and presented with flair. Open for breakfast, lunch, and dinner daily, guests can dine indoors, poolside or alfresco-style on the Seagrape Terrace that is surrounded by lush tropical gardens. Seagrape also offers in-room dining and specialized catering menus. TALDE Miami Beach is a popular Asian-American restaurant owned by restaurateur Dale Talde and partners David Massoni and John Bush of Three Kings Restaurant Group. Located in the historic 1930s Spanish-inspired cocktail bungalow known as The Backyard, TALDE Miami Beach is open for dinner nightly, with late-night hours on the weekend, and serves a creative menu of global small plates and avant-garde craft cocktails. 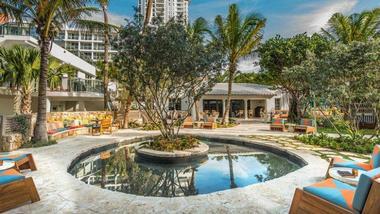 Amenities at the Confidante Miami Beach Hotel include two spacious heated outdoor swimming pools set amongst lush tropical gardens, with six private cabanas, three built-out bungalows and an inviting pool bar that overlooks the ocean. The hotel enjoys direct beach access and offers a full beach food and beverage service for guests and is home to two award-winning restaurants, and two cocktail lounges and bars. An open-air rooftop spa with full-service salon provides a range of pampering and indulgent spa services, including massages, body treatments, skin care and facials and salon services such as manicures and pedicures. An indoor/outdoor fitness center has a range of state-of-the-art exercise equipment and offers fitness classes daily. 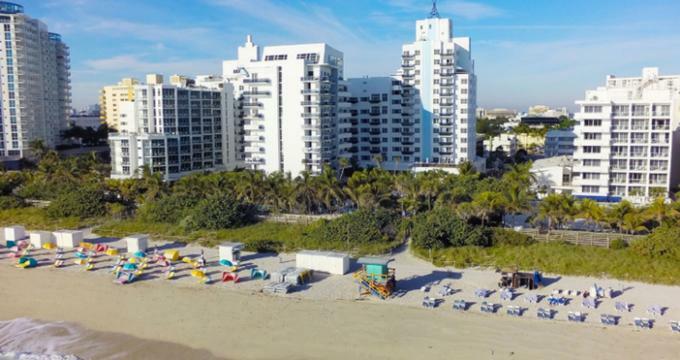 The Confidante Miami Beach offers over 35,000 square feet of indoor and outdoor multi-function meeting and special event space that can accommodate events for up to 1,000 people. Venues range from the historic 1930s House, which is ideal for intimate gatherings and private functions in a beautiful tropical garden setting to the open-air Vista Terrace that boasts breathtaking views of the Atlantic Ocean. The Crown Room features a sophisticated library bar and adjoining terrace – perfect for sunset cocktails. Interesting attractions within walking distance of the hotel and the surrounding area include the Art Deco and Design Districts, the Adrienne Arsht Center for the Performing Arts, Jungle Island, FillmoreMiami Beach at the Jackie Gleason Theater, the Lincoln Road Mall, and Wynwood Walls. 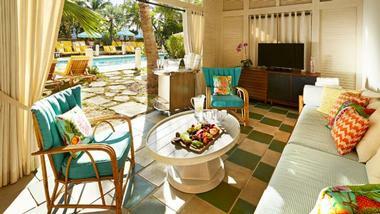 Don't miss South Beach for eclectic and vibrant wining, dining and nightlife.